What's that splash of color poking up through the melting snow? Why, it's a Snow Crocus, the earliest spring flower, growing with the first warming rays of the sun! Snow crocuses burst onto the scene with the first thaw in spring. All they need is for the ground to defrost enough for their hardy leaves to begin growing, and push through the snow laden soil. If it snows after they have emerged, they are unharmed. Crocus plants are native to Southern Europe and Asia. They are popular throughout the world. Early snow crocus blooms brighten up the landscape with white, yellow, blue, and light orange flowers blooming above thin, grass-like leaves. These small plants grow just 3-4 inches tall. Best of all, they are easy to grow and very prolific. 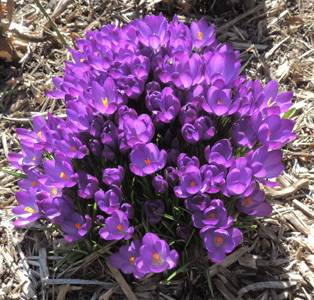 While many people refer to them as bulbs, Crocuses are actually corms, a bulb-like stem. Did you know? The word "Crocus" is Latin for Saffron. Knowing this, it should not surprise you that Saffron comes from the stigma of the Saffron Crocus. But, it takes thousands of flowers to get an ounce of Saffron. Crocus are grown from corms, a bulb-like stem. The mother corm will produce several baby corms, then usually die in the same year. The new corms can be dug up and separated to be replanted. Make sure to mark and keep colors separate, if you want to create a design or look in the new bed. Crocus look best grown in small clumps. However, you can plant them singly. In a year or two, that small group will become a major clump of attractive plants, regardless of how many you plant together. Crocus plants tolerate overcrowding. Plant Crocus corms in the fall. Select a sunny location where the soil is not too wet or soggy over winter and during spring. Select a spot where you can see them from a window of your house. You don't want to miss the first show of the year! Work the soil, adding compost to provide a rich bed for growth. Mix into the soil a generous portion of bulb fertilizer. Plant corms singly, or in groups as desired. These small corms can be planted using a trowel, a bulb planter, or just pushing them into soft soil to the proper depth of about 2 inches from the top of the corm. Add a thin (not thick) layer of mulch on top, if desired. After blooming, allow the plants to grow and die off naturally. The plant is producing and storing energy for next year. Once the plant has died, cut the dead leaves off at the ground. Remove and re-plant bulbs every couple years, to reduce crowding. Crocus make great forced blooms. See Forcing Bulbs.